We now have a UPS drop box in Germantown Hills, just off Jubilee Lane and the turn into the parking lot near Pizza Hut. Easy drive up and drop off UPS parcels. A new convenient way to ship parcels and so close. Daily pick up time is 2:45 p.m.: This is on a trial basis and if it does not receive enough activity they will remove the box after 6 months. So – pass the word to everyone in the community to use this box! 24/7 Access: UPS Drop Boxes are typically accessible any time. Each box has a pickup indicator so you will always know if the driver has made a final pickup for the day. All service levels: UPS accepts all service levels at all of its Drop Boxes, including UPS Ground and international packages. Package size can't exceed 16 inches by 13 inches by 3 inches. 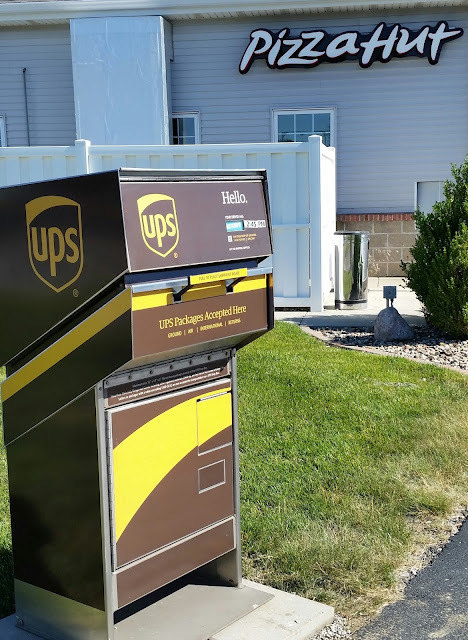 Easy returns: Even if you have a scheduled UPS pickup, the UPS Drop Box can be an asset to your clients or customers for documents or packages being returned to you. Shipping supplies: UPS drivers ensure the boxes are stocked with all the UPS supplies needed to label and ship packages.